Blue Isle Lake House & Casita w/ Pool, On-Site Boat Ramp, Protected Cove! Blue Isle was designed with a passion for lake lovers in mind and is located on a fantastic swimmable, no wake cove! 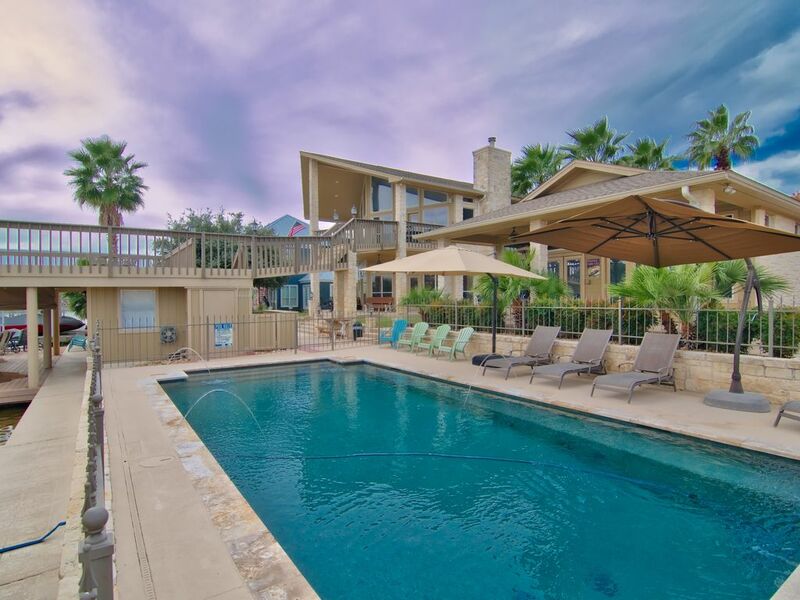 This spacious Lake LBJ vacation rental features top-of-the-line amenities with floor-to-ceiling windows, a Coca-Cola themed diner, pool table, on-site boat ramp, swimming pool, boat lift and jet ski lift for six pwc! Guests of this prestigious Web Isle estate will be rewarded with south-east exposure, 120’ of pristine waterfront and plenty of indoor and outdoor living space that creates the perfect palette for entertaining or for pure relaxation! Guests of Blue Isle are in for a treat, as Lake LBJ is the largest constant level lake in Texas. 21 miles of Texas Hill Country shoreline greets you with the perfect setting throughout the year with a wide range of recreational activities including boat cruises, fishing, wake boarding, wake surfing, paddle boarding and swimming. *Please note, the main house is available for smaller groups of 14 guests and under. Please inquire for custom quote. (BATHROOM DETAIL): #1 Master bathroom and #2 hallway bathroom located upstairs on main level; #3 hallway bathroom located downstairs on ground floor. Suite One: King size bed, two recliners, 55" flatscreen, Directv. Kitchenette with mini-refrigerator, sink, microwave and coffee maker. Full bathroom with large walk-in shower and double vanity. Suite Two: Queen size bed, twin bunk bed, two chairs. Full bathroom with large walk-in shower and double vanity. * Garage is unavailable to guests. Since 2005, FDVR has managed multiple vacation rentals on Lake LBJ, executed thousands of reservations. We have the knowledge and expertise needed for a successful rental experience. This property is guaranteed & professionally managed by Front Desk Vacation Rentals, a local, family owned and operated company since 2005. All our homes, including Blue Isle are on prime waterfront, very clean and well-maintained. #1 Master bathroom and #2 hallway bathroom located upstairs on main level; #3 hallway bathroom located downstairs on ground floor; #4 bathroom located outside at pool/boat dock room. Casita includes two full bathrooms, each with large walk-in shower and double vanity. Blue Isle is a 5 star luxury vacation rental located on a pristine no wake cove with swimming pool and PRIVATE ON-SITE BOAT RAMP! What a fantastic place to have a quite time with our family of 8 adults. John and Casey were so hospitable. The house had everything we needed for our four day stay. It was clean, well stocked and in the right area. Plenty of beds! However, the casita king bed could use a topper, it was like sleeping on the floor.....very hard! We will use this place again......but we will bring our own topper, just in case. Great place for a family weekend! We had a great time at the Blue Isle Lake House for Thanksgiving. The house is well apportioned, clean, comfortable, with plenty of room for a big family to spread out. Kayaking, fishing, and hanging out was a recipe for a great weekend. Will definitely book again! Very nice property. Loved the pool and boat dock. Sleeping arrangements very comfortable. Kitchen and living area great for large families. Perfect home for a large group with just enough space to be together but also spread out! Our stay at the Blue Isle Lake House & Casita was perfect in every way! We were a large multigenerational group celebrating a 50th wedding anniversary for my parents. There was lots to do for everyone and the shaded dock on the swimmable cove was ideal. The paddle boards, kayak, and peddle boat all made for a fun time! The house was neat and tidy and great for a large group with many places to congregate together or to spread out. The pool was wonderful. We rented a boat and jet skis from Splash and all together had an amazing weekend! We highly recommend this property.